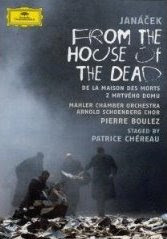 From the House of the Dead by Leoš Janáček was virtually completed in 1928 when the composer died. It turns out I don't have to go to New York. I think this film from 2007 from Aix-en-Provence is the same production. Yes. The film reunites Patrice Chereau and Pierre Boulez who did the centennial Ring together in 1976. At the Met it is Salonen conducting. New for the Met are Peter Mattei as Shishkov and Willard White as Gorianchikov. Many of the rest of the cast are the same as the DVD. It uses the edition prepared by Sir Charles Mackerras, the father of all modern Janáček, and John Tyrrell. Enough journalism. No one tops Dostoevsky, the source of the plot, for unrelenting grimness. I used to read a lot of Russian literature when I was much younger, and loved it. Now this opera is simply too dark, though there is a brief turn toward the light at the end. We are in a men's prison, and the opera consists almost entirely of prisoners telling their grim stories of violence. The music is wonderful, just the right balance of dissonance and consonance to please. But there are no sopranos to thrill us and charm us as there are in Jenufa. It definitely violates the three baritones rule. [Never go to an opera where three of the characters are baritones.] In fact they all seem like baritones, even when they're not. The captured eagle is freed and flies away. Thank God.